Preface: Whether we are “Gentile or Jew, circumcised or uncircumcised, barbarian, Scythian, slave or free,” we do not study the Scriptures only for ourselves. We study the Scriptures, to paraphrase Paul, so that the “word of Christ [may] dwell in you richly as we teach and admonish one another with all wisdom.” When we realize that each passage of Scripture is not about me, we begin gradually to see that the true subject matter of the Bible, what the book is really about, is God’s redeeming work in Christ. God is restoring all of creation (including me), but I am not the center of God’s kingdom work. This is a much greater thing to be absorbed with than ourselves. So many great thoughts to process in my book. I am especially lingering on those with regard to racial issues because the race issue hits so close to him. When I lived in the south, there was an undeniable race problem between white and black Americans. In the city in which I now live, there is an undeniable race problem between white and native Americans. What does the Bible really say about race relations? 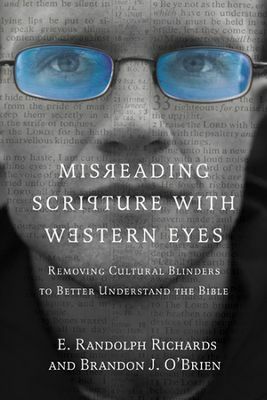 As a Christ follower, much more than as a Westerner, how do I let scripture speak to my heart about my prejudice and favoritism? This topic is one on which majority culture and minority readers will have very different perspectives. It’s probably useful, then, that we acknowledge from the beginning that we primarily have majority culture, specifically white, readers in mind when we describe what goes without being said about race and ethnicity in the West. In general, minority readers will be considerably more sensitive to these issues. It is the unfair privilege of majority peoples to not worry about the difference ethnicity makes; it is not an important part of our everyday lives. So in the rest of this chapter, we will refer primarily to white male Westerners. Like the world we inhabit today, the worlds of both the Old and New Testaments were ethnically diverse and richly textured by an assortment of cultures, languages and customs. And also like today, ancient peoples had a number of ways of distinguishing between locals and out-of-towners, friends and enemies, the elite and the marginalized. Prejudice comes in all varieties, yesterday, today and tomorrow. From time immemorial, humans have held prejudices against others based on their ethnicity, the color of their skin or factors such as where they’re from and how they speak. If visitors to a foreign culture have a hard time detecting ethnic stereotypes based on geography, we have an even harder time detecting the same issues in the Bible. We are unfamiliar with the geography of the Near East, as well as the prejudices that adhered to certain locations. Sometimes they are made blatant. We grew up singing a hymn that began with the line, “I stand amazed in the presence of Jesus the Nazarene.” But Jews in neighboring areas seldom found anything amazing about Nazarenes. When Nathanael found out Jesus was from Nazareth, he was unimpressed; “Nazareth! Can anything good come from there?” he replied (Jn 1:46). Those of us accustomed to referring to our Savior as “Jesus of Nazareth” don’t have a negative association with the place. How do we uncover what goes without being said about race and ethnicity? A first-and difficult-step is making a thorough and honest inventory of your assumptions about people who are different from you. Take time to prayerfully consider your prejudices. Do you harbor bad feelings for members of a particular ethnic group? Or people from a certain sociopolitical group? If you feel brave enough, consider asking your close friends or family whether they hear you make statements or tell jokes about certain people or groups. Carefully consider why you feel the prejudices you do. Does it have to do with your upbringing? Is it economic-that is, do you make judgments about people based on their appearance or perceived status? Think through the categories above (geography, accent and place of origin). Do you have preconceived ideas about people based on these? Your increasing awareness about your own ethnic prejudices will help you be more attuned to them in the biblical text. The Christian message is clear: ethnic prejudice is morally reprehensible. It is wrong. The Roman world was filled with racism. The interior of Anatolia (modern Turkey) was filled with tension between the Romans, the locals and the immigrants (Jews in the south and Celts in the north). Nonetheless, Paul tells a church caught right in the middle of that mess, “Here there is no Gentile or Jew, circumcised or uncircumcised, barbarian, Scythian, slave or free, but Christ is all, and is in all” (Col 3:11). This was a radical claim in the first century. It is no less radical today, even in a country in which people have been fighting for equality for decades. The radical nature of the multi-ethnic body of Christ is sometimes lost on those of us who believe we have put prejudice behind us once and for all. Columnist Jack White once observed, “The most insidious racism is among those who don’t think they harbor any. His point is that those of us who leave our ethnic stereotypes unexamined will inevitably carry them forever, perhaps even pass them on to others. We would add that failing to come to terms with our assumptions about race and ethnicity will keep us blind to important aspects of biblical teaching. Learning to think, act and live without any hint of favoritism is doable only through the Spirit’s work in my life! Naturally, I’m prone to generalizations and quick judgments. I’m quick to see a situation with white privileged eyes. In many ways I am unable to process situations any other way than how I was born and raised. But naturally isn’t how I’ve been left. Jesus is transforming me through His power to supernaturally think, act and live. Through Him I am able to die to generalizations and quick judgments. I’m able to plead for His eyes to see prejudice for what it is and to crucify it daily. For He who said, “You shall not commit adultery,”also said, “You shall not murder.” If you do not commit adultery but do commit murder, you have become a lawbreaker.